This true story, written by the survivor of a U-boat attack, gives us a mesmerizing glimpse into a child’s view of war. In 1940, Hitler prepares to invade Britain. Children living in vulnerable areas in Britain are offered evacuation to the British Dominions to escape the impending invasion. As a 7-year old, the author, together with her siblings, waves goodbye to her parents and sets off for Canada. By an incredible act of seamanship, the captain manages to navigate SS Volendam – a ship with a 60’ hole in the bow – 200 miles to Scotland. The description of this remarkable achievement, which will impress the most jaded old salt, is based on the captain’s report to the Admiralty. On arrival in Scotland, a diver checks the damaged bow and makes a startling discovery; a discovery immediately suppressed by wartime security. The author, still eager to reach Canada, is scheduled to travel on SS City of Benares. Fortunately, fate intervenes and she cannot embark. Two weeks later, SS City of Benares sails. It, too, is torpedoed but sinks within minutes and only thirteen children are saved. This heartrending tragedy is mitigated by the inspiring story of eight little boys who survive over a week in an open boat. Encompassing the stories of the children who reached other countries, set against the drama of Britain fighting through the Blitz and the Battle of Britain, this is a mesmerizing glimpse into a child’s view of war. 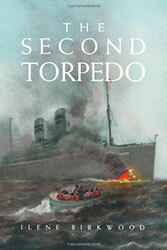 The Second Torpedo is a riveting combination of personal memories, other survivors’ stories, and research material. The author uncovers facts long suppressed by the War Office – among them an unexploded torpedo which lay in SS Volendam’s hold. Had it exploded, she would have gone to a watery grave before her eighth birthday.